turned out for the meeting. It was a battle few thought could be won -- until last week, when U.S. District Court Judge Alan Kay granted a temporary injunction that delays the Star-Bulletin's scheduled Oct. 30 closure. "There are a lot of people like I who supported the Star-Bulletin from the beginning because it was a battle that had to be fought. We expected to lose," said Beverly Keever, a University of Hawaii journalism professor. "But now, with Judge Kay's ruling, we think it can conceivably be winnable. It's a test case for the nation." Keever was one of about 200 people who turned out yesterday for a public meeting at Washington Intermediate School organized by Save Our Star-Bulletin, a citizens group that, like the state, has filed suit to stop Gannett Co. and Liberty Newspapers from closing the paper. 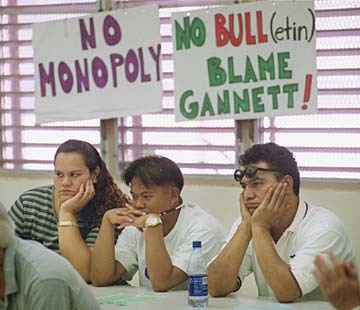 Buttons, bumper stickers and petitions were distributed amid a background of poster signs saying, "No Bull(etin) -- Blame Gannett." "If you want a voice, if you want a choice, you need to mobilize and inform," said Lucy Witeck, president of the Hawaii Newspaper Guild. Geri Bell, Edmund Loy, Chelsea Fernande and Mary Adamski. She said people still come up to her and say, "But they're losing money." "No, I say, they're just not making enough." Gannett lawyers, who have filed a notice of intent to appeal Kay's order, said the Star-Bulletin is losing $10 million a year. That figure puzzles SOS officials. Star-Bulletin owner Rupert Phillips said he earned a 12 percent profit, but it wasn't enough to keep him involved. If the public doesn't get involved in saving the Star-Bulletin, who will decide what stories get printed in the lone paper remaining? Witeck asked. People wanted to know what they could do to support the fight. "Continue with petitions and letters to the editor, attend the City Council meeting, ask your neighborhood boards to pass resolutions," Witeck said. Sunday's Save Star-Bulletin Community meeting. 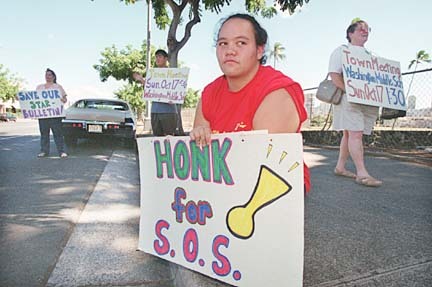 A Kaimuki woman had her own answer. "I'm canceling my subscription to the Advertiser and switching to the Star-Bulletin," said Ursula Hare. 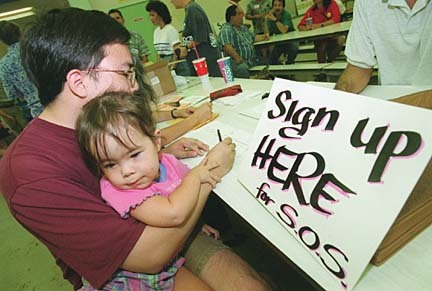 "I grew up in Vienna, where keeping your mouth shut was survival," said the Kaimuki senior citizen. "Then I met an Englishman who taught me the only way to preserve democracy is to speak up." SOS members said the Honolulu City Council will meet at 10 a.m. Wednesday to consider a resolution supporting the Star-Bulletin. Four neighborhood boards have passed resolutions to save the paper, and others are considering it, according to SOS. Attempts are being made to find buyers for the Star-Bulletin, said Wayne Cahill, administrative officer of the Hawaii Newspaper Guild. Not many potential buyers know the paper could be up for sale, he said. "The credibility of newspaperdom is at stake," Keever said. "The dirty little secret is out: Only big profits count. What I don't like about Gannett is that people don't count. "This meeting shows a lot of little people can make a difference."